Emory freshman forward Erin Lindahl puts up a shot in the Eagles’ final home game of the season. Photo courtesy Mathew Hammond/Staff. The Emory women’s basketball team closed their 2016-17 season with a tremendous win against the University of Rochester (N.Y.) Yellowjackets 73-57 Saturday, Feb. 25. Star senior point guard Shellie Kaniut closed her career with a bang, leading the Eagles in scoring with 20 points. Kaniut was one of three seniors to play their final game at the WoodPEC. Senior guard Fran Sweeney and senior guard/forward Michelle Bevan also played their final game in front of the Emory faithful. Head Coach Christy Thomaskutty praised her seniors for their hard work and contributions to the basketball program. Outscoring the Yellowjackets 21-8, Emory scorched Rochester in the first quarter. The Eagles established a 13-point lead, concluding the quarter with a 9-0 run. Kaniut was strong out of the gate, posting 10 points. In light of Kaniut’s brilliant performance, the point guard affirmed that it was her ability to make her teammates better that was most important. Rochester battled back, cutting Emory’s lead down to two points before the end of the half. The Yellowjackets stepped up on defense to limit Emory to eight points in the quarter. After seeing their lead nearly vanish, the Eagles were poised to distance themselves from Rochester. Emory bounced back and started off the third with six unanswered points. Rochester attempted to chip away at Emory’s lead, but the Eagles remained strong. Thomaskutty recapped how her team was able to respond to a challenging second quarter and control play again in the third. With a 47-39 lead entering their final quarter, the Eagles fought hard for victory. Emory’s execution was magnificent, growing their lead until the final buzzer; the Eagles’ offense shined as they scored 26 points to Rochester’s 18. Riding the offensive momentum, Emory finished with a 73-57 win. Thomaskutty reflected on what made her team effective in their preparation and matchup against Rochester. Kaniut considered the victory a great way for the seniors to end their careers and for the underclassmen to establish a benchmark moving forward. 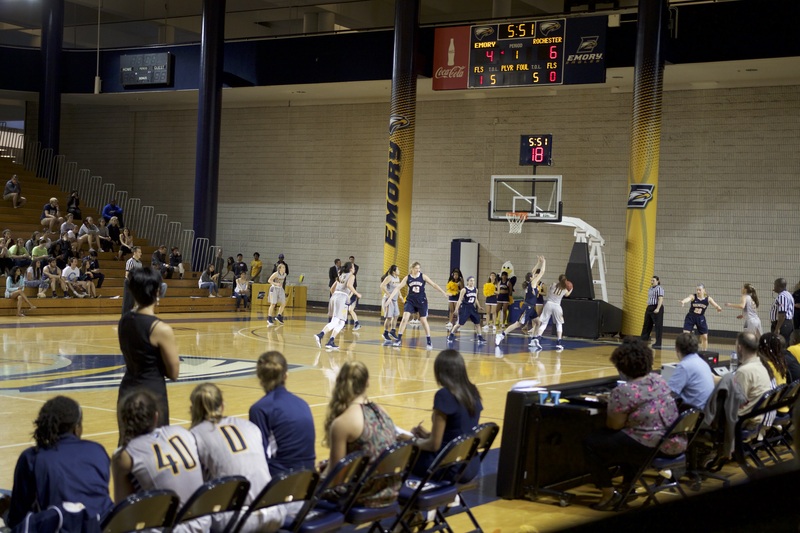 Emory’s victory advanced the squad to a 6-8 UAA record and 15-10 record overall. The Eagles finished fifth in the UAA, an improvement from last season’s seventh place finish.